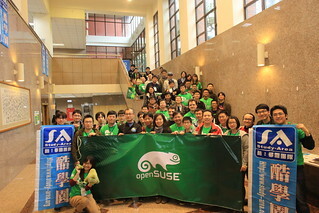 The openSUSE.Asia Summit brought people from all over Asia together for one purpose; to share knowledge about open source development and to inform attendees of community initiatives and progress with project developments. The summit, which took place in Taipei, Taiwan, Dec. 4 – 6, even had a release party for openSUSE Leap 42.1 that was co-hosted with Ubuntu. Mr. Mohammad Edwin Zakaria, IT and Linux consultant, traveled from Indonesia to present how schools there are using the openSUSE Education project to enhance educational quality and equality. Kenny Chen, a contributor from Taiwan, provided a hands-on experience at the summit by teaching attendees about using High Availability Clusters with openSUSE. Ben Chou, a Software Engineer from SUSE’s Quality Assurance team in Taipei, discussed continuous integration and the capabilities of using Jenkins. Dominique Leuenberger, who traveled from Switzerland, provided a presentation about the complexities of building the fast paced, updated versions of openSUSE Tumbleweed using controls to eliminate the risk of breaking users systems. Michal Hrusecky, who is on the openSUSE board, traveled from Czech Republic to provide the keynote speech for the second-annual summit and updated the attendees about the progress of the openSUSE project.